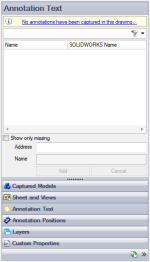 This option will display the captured parameters that are missing. 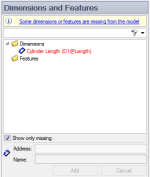 A missing parameter is one that is captured but has since been removed or renamed in SOLIDWORKS. The images used above show missing dimensions, the principle is identical for Annotation Text. To capture parameters from a drawing, the drawing must fist be captured to a part or assembly, see Drawings for more information. Open the drawing that has been captured in SOLIDWORKS. 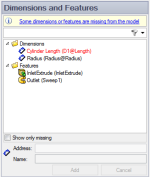 Select the annotation from the SOLIDWORKS drawing graphics area. The address and name box in the annotation text section in DriveWorks Pro is filled in with the annotations full SOLIDWORKS name. The name of the annotation can be changed in DriveWorks to make it easier to identify when building rules. DriveWorks will display the type as Annotation Text in the Drawing Rules list, so choose a name that is relevant to the type of annotation text it is. For example if you have captured a geometric tolerance block name the parameter GeoTolBlockA. If you remove an annotation and save your group, the action cannot be undone. Furthermore, if you have already created any rules for the removed dimension, then they will be lost. Before removing an annotation, you may wish to make a copy of your group and projects.